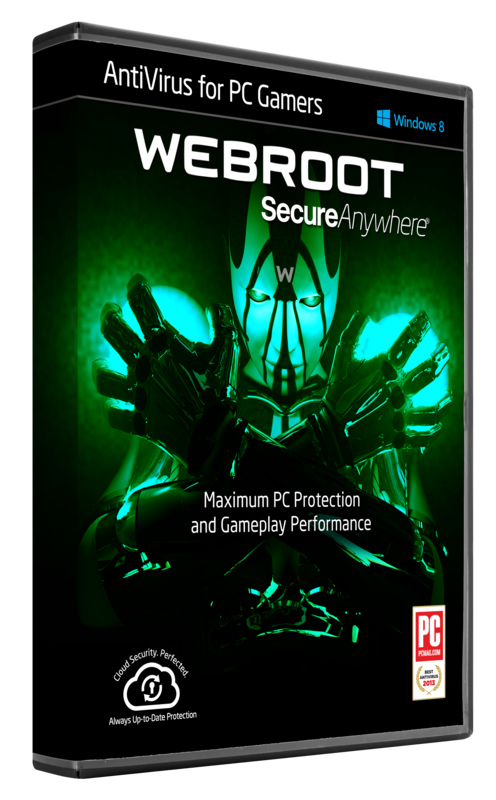 Webroot Antivirus for PC Gamers 2016 provides real-time protection for your PC, blocking viruses, malware, phishing attacks and identity theft without impacting gameplay. Our unique, secure smart cloud technology scans fast and secures your online identity and financial information without interrupting or slowing down your online experience. Our proprietary Webroot Threat Intelligence Network is continuously fed with advanced threat data from over 30 million worldwide users. With sophisticated behavioral analysis and real-time updates, Webroot solutions guard against both known and new threats to bring total protection to your online life. Get gaming security created by PC gamers for PC gamers. Lightning-fast scans with no interruptions so you and your device won’t be slowed down. Proactively checks websites and links for malicious content and blocks fake sites that trick you into entering personal information. Detects and blocks webcam spying threats. Cloud based protection offers real-time updates to secure against known and newly discovered threats. Real-time protection via the our proprietary URL Classification Service, which notifies users if links on their news feed, community board, or chat are malicious. Analyzes operating systems to detect system issues for optimal performance, wipes away all traces of online activity and makes deleted files unrecoverable. US-owned company with Colorado-based tech support. Fully protected in 5 seconds. Webroot security is up and running in 5 seconds - 38x faster than the competitor average. This chart compares the minimum installation time it takes fot Antivirus products to be fully functional and ready fot use by the end user. Products with lower installation times are considered better performing products in this category. We won't slow you down. Webroot uses 11x less computer memory than the closest competitor during system idle. This chart compares the average amount of RAM in use by an Antivirus product during a period of system idle. This average is taken from a sample of ten memory snapshots taken at roughly 60 seconds apart after reboot. Products with lower idle RAM usage are considered better performing products in this category. Webroot uses 143x less disk space than the next closest competitor. This chart compares the total size of files added during the installation of Antivirus products. Products with lower installation sizes are considered better performing in this category. We 're also the fastest in scheduled scans at 1 minute 12 seconds - 16x faster than the competitor average. This chart compares the average time taken to run a system scan at a specified time. Products with lower scan times are considered better performing in this category. Get Webroot Antivirus for PC Gamers NOW!